I am looking at using the OneWire (1-Wire) protocol to build a string of switches for Teensy (Arduino). The OneWire protocol is a communication Bus System that sends and receives data over a single wire. It is meant for low data rates, and so using it for addressable switches, when all I need is to know off or on, seems perfect. 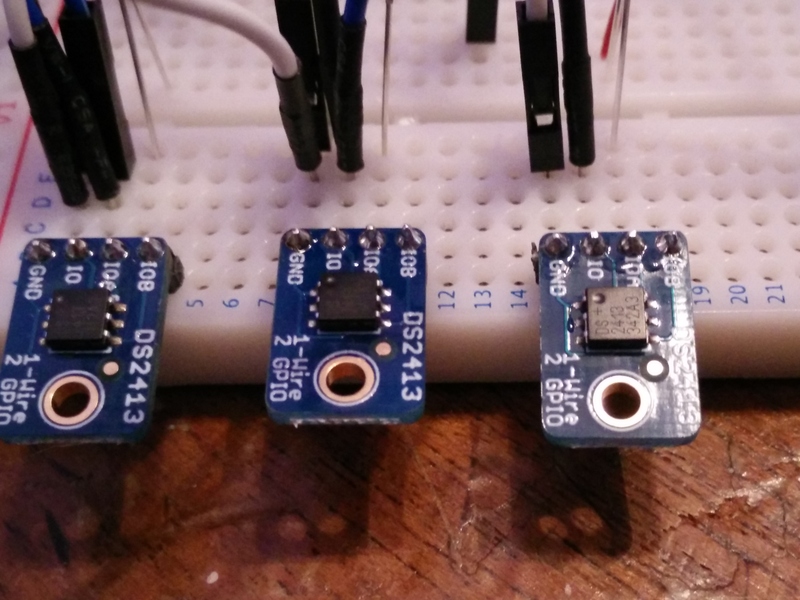 I looked at the DS2413 chip as it has two IO pins that can be read as either on or off, and this state can be sent to the controller when polled. Well, it needs two wires really, as you have to have a ground wire also. So far so good. I have a sketch that searches for all OneWire devices on the bus, and reports back the ID numbers of each of those devices. The multiple ID numbers are then put into an array. Thats all it does for now, not much, but its a start. //now print what was stored in the array by the fillArray() method.